Objectives: To study the treatment efficacy of tetracyclines and azithromycin in Mycoplasma genitalium positive patients attending an STD clinic. Methods: All M genitalium positive patients (34 men and 26 women) attending an STD clinic during a 6 month period were treated with antibiotics. All patients known to be partners of M genitalium positive patients and those who were M genitalium positive, but not initially treated, were treated with azithromycin. Patients with urethritis and/or cervicitis were treated with tetracyclines before their M genitalium status was known. 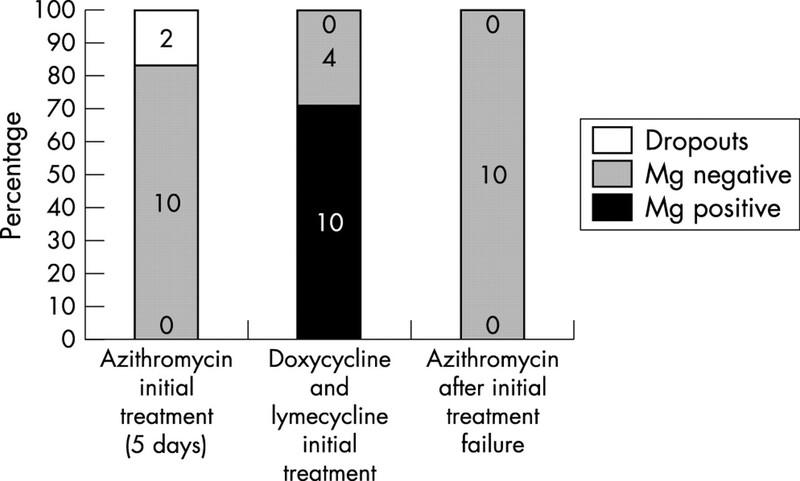 Results: 10 of 14 women (71%) and 10 of 16 men (63%) treated with tetracyclines were M genitalium positive at follow up, whereas all patients treated with azithromycin (16 men and 20 women) were M genitalium negative, at the 4 week follow up visit. Conclusions: These results suggest that tetracyclines are not sufficient to eradicate M genitalium. Randomised controlled treatment trials are urgently needed. The aim of this open pilot study was to compare the antibiotic treatment efficacy of tetracyclines and azithromycin in M genitalium infected patients. A prevalence study of 519 men and 464 women attending the Örebro STD clinic was performed between 1 February and 31 July 2000 comparing signs and symptoms between M genitalium and C trachomatis genital infections. Two of 519 men had gonorrhoea but were negative for C trachomatis and M genitalium. In three of 464 attending women, samples for M genitalium were not taken. M genitalium was detected in 26 women and 34 men, and four of each gender, had a concurrent infection with C trachomatis. Patients with urethritis (>4 PMNL/high power field) and/or cervicitis (PMNL >epithelial cells in vaginal wet mount) were treated with doxycycline, 200 mg the first day and 100 mg the following 8 days, or lymecycline 300 mg twice daily for 10 days. However, some patients were treated otherwise, because of conditions such as epididymitis, prostatitis, and suspected low compliance, and therefore three of the M genitalium positive male patients were treated with ofloxacin, 30 days of doxycycline, or single dose azithromycin, respectively. All patients not receiving treatment initially but having a positive M genitalium test were treated with azithromycin 500 mg the first day and 250 mg for the following 4 days. Steady partners to patients with an M genitalium infection were treated with azithromycin for 5 days. All M genitalium patients were asked to return 4–5 weeks after treatment commenced. After the follow up visit, those treated with tetracyclines initially but still M genitalium positive or with remaining symptoms of urethritis or cervicitis were treated with a 5 day course of azithromycin. Attending men had first void urine (FVU) samples collected. C trachomatis was detected by the Cobas Amplicor Chlamydia trachomatis test (Roche Diagnostic Systems, Inc, Branchburg, NJ, USA). M genitalium was detected by polymerase chain reaction (PCR) using primers detecting the M genitalium 16S rRNA gene.5 All positive results were confirmed by a PCR detecting the MgPa adhesin gene.6 Samples for Neisseria gonorrhoeae (culture) were taken in 88 men. Women were tested for M genitalium in FVU and from endocervical specimens as described above. C trachomatis was detected in FVU and endocervix by PCR and culture, respectively. Endocervical and urethral samples were cultured for N gonorrhoeae in 65 women. Sampling for N gonorrhoeae culture was only performed on patients at risk, because of the low prevalence in Sweden. Three of 34 M genitalium positive men were not treated with the standard treatment and were excluded in the treatment comparison. Those with a concurrent C trachomatis infection were treated with tetracyclines (n=3) or ofloxacin (n=1). At follow up all were C trachomatis negative, but those receiving tetracyclines were still M genitalium positive. Out of 20 men treated with either doxycycline (n=14) or lymecycline (n=6), 16 reattended and 10/16 (63 %) were still M genitalium positive after a median of 43 days (mean 39, range 27–90 days). After a second treatment with azithromycin eight of 10 reattended after a median of 38 days (mean 42, range 31–79) and were all M genitalium negative. All eight of 11 initially treated with azithromycin who reattended were M genitalium negative at the follow up visit after a median of 43 days (mean 67, range 23 to 170 days) (fig 1⇓). Among the M genitalium positive men initially treated with azithromycin, a subgroup of six had symptomatic urethritis. These patients could be compared to 15 M genitalium positive patients with symptomatic urethritis who received tetracyclines. 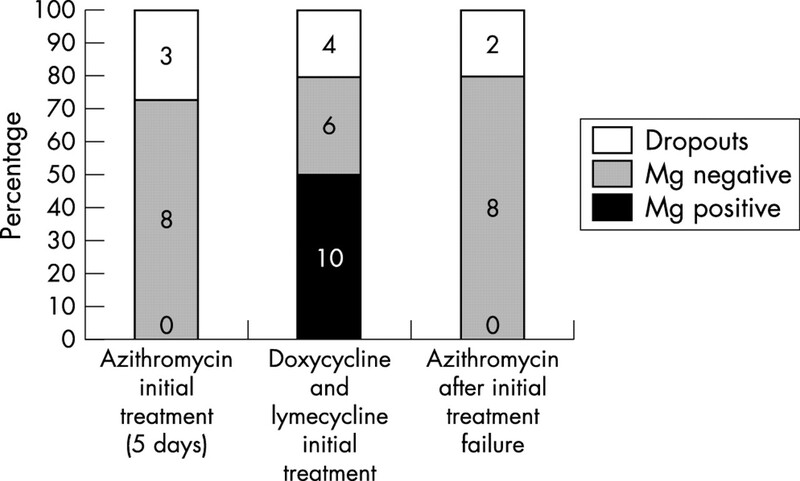 None of those receiving the 5 day course of azithromycin were positive at follow up whereas 10 of the 15 (67%) in the tetracycline group were still M genitalium positive at follow up (Fisher’s exact test =0.0124). None had a concurrent C trachomatis or N gonorrhoeae infection. Outcome of antibiotic treatment in 31 M genitalium (Mg) infected men. The figures in bars indicate number of patients. Fourteen M genitalium positive women were treated with tetracyclines (eight with doxycycline and six with lymecycline). Four of the women treated with lymecycline had a concomitant C trachomatis infection. Ten of the 14 (71%) women were still M genitalium positive, at the follow up visit after a median of 35.5 days (mean 42, range 24–90 days). These women were then treated with a 5 day course of azithromycin and all 10 reattended after a median of 31 days (mean 44, range 22–98 days) and were at that time M genitalium negative. Of 12 women initially treated with azithromycin (all C trachomatis negative) 10 reattended after a median of 32 days (mean 40, range 23–89 days) and were all M genitalium negative (fig 2⇓). N gonorrhoeae was not isolated from any patient. Outcome of antibiotic treatment in 26 M genitalium (Mg) infected women. The figures in bars indicate number of patients. The treatment groups from the present study of M genitalium infected patients were not equal in symptoms and signs and therefore not directly comparable, but in a subgroup of M genitalium infected men with symptomatic urethritis there was a statistically significant difference indicating that azithromycin could be more efficient than tetracyclines. The widely used treatment for urethritis and cervicitis with tetracyclines does not appear to be sufficient to eradicate M genitalium and this should be considered in treatment guidelines. A randomised controlled treatment trial is urgently needed to evaluate the efficacy of azithromycin at different dosages. We are most grateful to the staff at the Örebro STD clinic and especially to Maritha Holmqvist. Birthe Dohn at Statens Seruminstitut provided excellent technical assistance. LF initiated the study, examined and sampled most of the patients, he also collected all data and wrote the first draft of the manuscript; HF was responsible for the N gonorrhoeae and C trachomatis tests, he contributed to the design of the study and analysis of the data; JSJ was responsible for the M genitalium tests, he provided major contributions to the design of the study and analysis of the data. Jurstrand M, Falk L, Fredlund H, et al. Characterization of Chlamydia trachomatis omp 1 genotypes among sexually transmitted disease patients in Sweden. J Clin Microbiol2001;39:3915–19. Stamm WE, Hicks CB, Martin DH, et al. Azithromycin for empirical treatment of the nongonococcal urethritis syndrome in men. A randomized double-blind study. JAMA1995;274:545–49.